A huge bronze sculpture, believed to be the largest in the UK, has arrived outside the Theatre Royal in Plymouth. Messenger, a 7m (23ft) tall and 9m (30ft) wide woman in a crouching position, was driven through the city on a flatbed lorry. 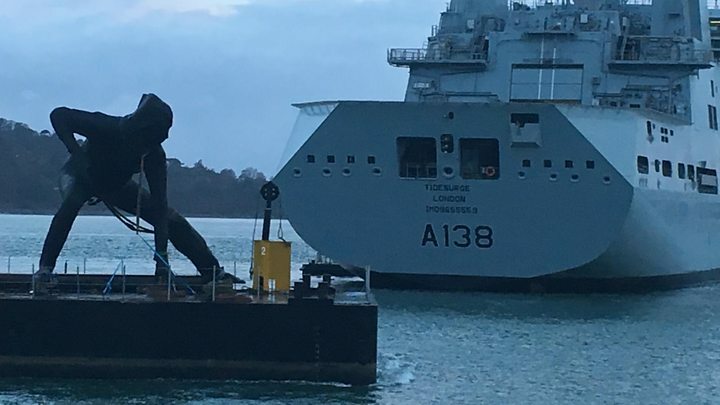 The 10-tonne sculpture, designed by artist Joseph Hillier, was paraded into the city on a barge earlier. Mr Hillier said he had been inspired by the movement of an actor rehearsing at the theatre. The sculpture’s name refers to the “pivotal” role of a performer to “breathe life into words”, he added. It is part of a £7.5m regeneration project. The theatre said: “We wanted to do something bold that reflected the creativity that is at the heart of the Theatre Royal. “It will create a unique landmark for the city and strengthen its cultural offering. When it is in place, visitors will be able to walk between Messenger’s legs “into the theatre, like an archway”. The Theatre Royal said it was “by far” the UK’s largest bronze sculpture by volume, at 25.6 cubic metres.